Must be shipped to a physical address. We will not ship to P.O. boxes. DO NOT pull a vacuum when using this product. If you plan to pull a vacuum or are charging a larger system or dual air system such as on a van, suburban, or SUV, use Enviro-Safe Industrial 134a Replacement refrigerant. *Note: all products in this kit are not usually used at one time to charge a single vehicle. Includes: 1 can Stop Leak 2 cans Refrigerant with Dye 1 Oil Checker 1 Charging Hose This kit DOES NOT include a pressure gauge. Fully compatible in most systems. The temperature pressure chart represents the temperature of the product when inside the system. Flammable to an open flame or spark, proceed with caution if used in systems designed for non-flammable refrigerants. This product cannot be shipped to Alaska, Hawaii, or any other overseas country except in pallet quantity. 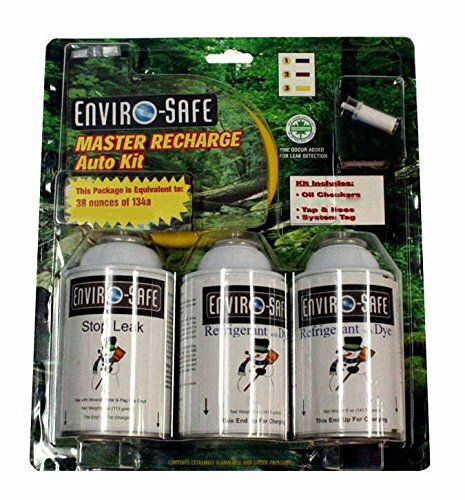 If you have any questions about this product by Enviro-Safe, contact us by completing and submitting the form below. If you are looking for a specif part number, please include it with your message. Interdynamics (MAC-134RFLCA) EZ Chill R-134a Refill - 18 oz. A/C PRO ACP-102CA A/C PRO Professional Formula R-134a Refrigerant Refill - 12 oz. Interdynamics (HMR-134CA) R-134a Refrigerant for High Mileage Vehicles - 12 oz. Interdynamics 301CA R-134a Refrigerant - 12 oz. FJC 9158 Extreme Cold Refrigerant Additive - 8 oz.